We don’t need anymore proof that Breezy and Rih Rih are smashing! Amidst rumors they’ve been sneaking around having intimate trysts, Rihanna and Chris Brown hit the town together on Wednesday night as they were in attendance at Jay-Z’s concert in Brooklyn, NY. The former couple was seen sitting together behind Beyonce and Rita Ora in VIP as Jigga performed his fifth consecutive show at the newly opened Barclay’s Center. 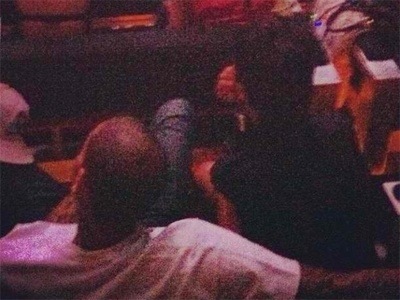 Hip hip journalist Elliott Wilson snapped a picture of the two watching Hov work. Brown sat comfortably with his right arm across the back of his ex girlfriend’s chair, while Rih was leaning slightly forward taking in the performance. The timing of this public appearance together comes on the heels of reports that the couple got rather cozy in a NYC nightclub on Monday. As we previously posted, Brown and Rih Rih were seen hugging and kissing at hot spot Griffin. Paparazzi even caught pictures of Breezy leaving the Gansevoort Hotel, where Rihanna was staying, the following day. What might Breezy’s current girlfriend, Karrueche Tran, think of it all? Well there has been chatter on Twitter that Tran dumped him following news of the nightclub visit. Fans have since been using cryptic tweets from the aspiring model to make the case for the breakup. With those tweets and the obvious quality time Rihanna and Chris Brown have been spending together, talk of them being an item again has taken over social media. Word has it that a few months back Jay-Z did not approve of Chris and Rihanna spending time together… but we’re guessing he’s coming to terms with it now. This entry was posted in Celebs and tagged Chris Brown, concert, date, Jay-Z, lovers, Rihanna, soulmates. Bookmark the permalink.